My niece Talia is recuperating so a quick dessert was urgently needed! 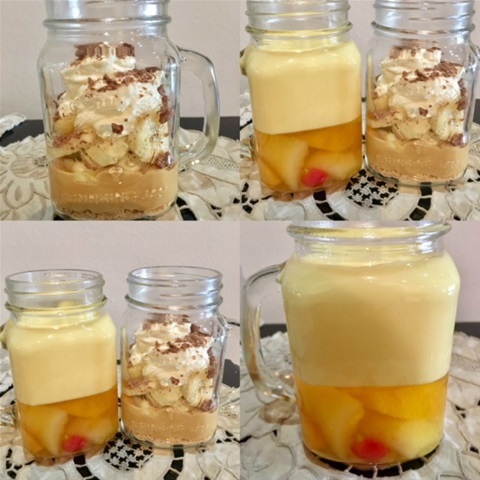 Most desserts need time to set, but I have discovered that if you make the dessert in individual jars, it can be eaten straight away. I bought these jars that are all the rave right now, but you could just use whatever wine glasses you have. I made a deconstucted Banoffi and Jelly and Custard with a twist! Ingredients for Jelly and Custard. 2 packets pineapple jelly, 1 tin KOO fruit salad, 1 litre custard (I used store bought). Place some fruit in the bottom of the jar. Make the jelly according to the package instructions and pour into a jug. Carefully pour some jelly into the jar making sure to cover the fruit. Place the jars in the freezer for 30 minutes or until the jelly is set. Then remove from the freezer and pour over the custard. Easy, Quick, Delicious! 1 packet tennis biscuits, 1 tin (360g) caramel topping, 250ml fresh cream, 6 bananas, 1 flake. Prepare all your ingredients - crush the tennis biscuits, beat the fresh cream with a tablespoon of sugar, slice the bananas, add a little of the beaten cream to the caramel topping and whisk together. Then start layering in the jar - first a layer of crushed biscuits, then add the caramel topping, then the bananas and finish with a dollop of cream and a sprinkling of flake. Both these desserts can be stored in the fridge to enjoy at any time!